The turquoise waters of the Mediterranean, the Aegean, and the Black Sea, as well as the Sea of Marmara, surround Turkey to the south, west and north. With over 8,333 kilometres of coastline along the four seas, Turkey is a veritable treasure chest of coves, inlets, bays and beaches that the yachtsmen appreciate. Especially, the Aegean and Mediterranean coasts, with the well-equipped marinas, unique secluded bays and clear sea, is a center of attraction. 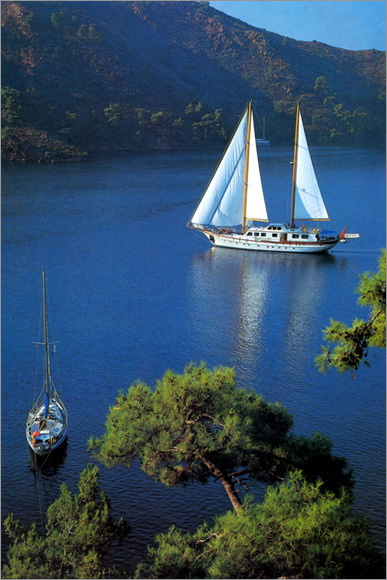 Cruises in this sailing paradise of Turkey is also home to the famous, so-called “Blue Voyage”. This idyllic cruise means sailing with the winds, anchoring in the most beautiful and cleanest bays, gulfs and the beaches, acknowledging the magnificent monuments of the ancient civilizations, meeting unthinkable beauties and becoming one with nature. For lovers of the active life, sailing in clear waters provides great opportunities for swimming, fishing, waterskiing, surfing and diving. It is also an experience of the history of man from the perspective of the sea rather than from the land, a journey which carries you to the private beach of Cleopatra, the eternal fires of remains of ancient civilizations at the Olympos Mountain. This voyage, remains as a legendary moment in the memories. 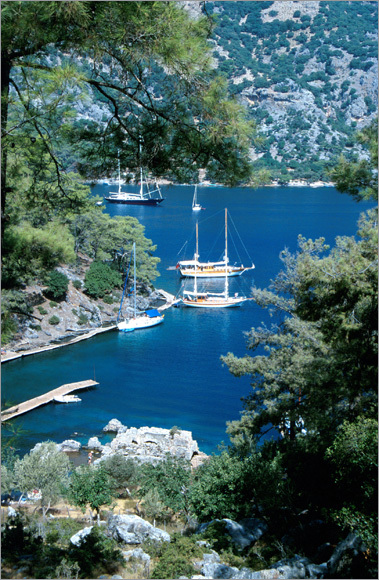 Sailing in Turkey also allows you to experience a truly enriching cultural exchange with the hospitable and gracious people of the fishermonger villages, enjoy the serenity of the secluded bays and the comfortable luxury of the marinas. The tempered winds which generally blow from the west and northwest make the long summers ideal for yachting, and seem to encourage an appreciation of nature. From some of the turquoise coast's unspoilt and sheltered bays you can see mountain peaks rising to almost 3,000 metres above sea level. It is easy to reach almost all the world’s seas from Turkish waters. 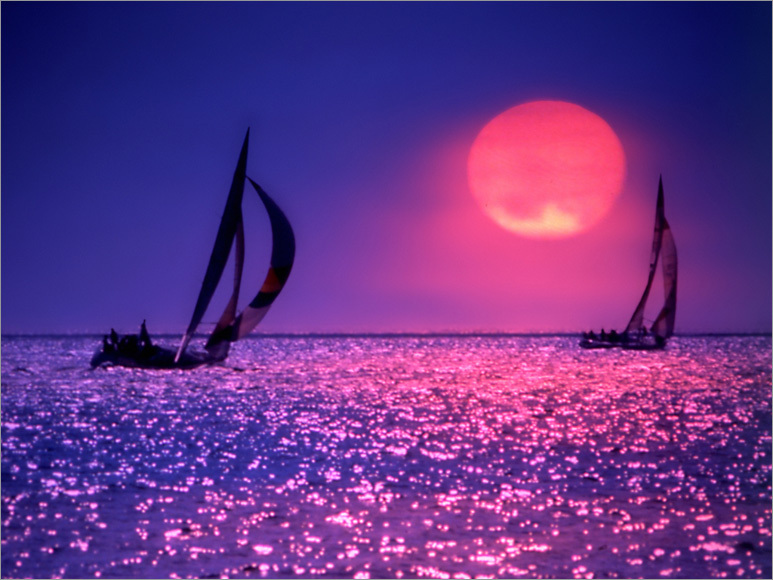 Yachtsmen, can safely and easily sail, for example, from the North Sea, through the European Channel system, over the Rhine and the Danube, to the Black Sea, and from Istanbul and the Dardanelles to the Aegean and the Mediterranean coasts of Turkey. 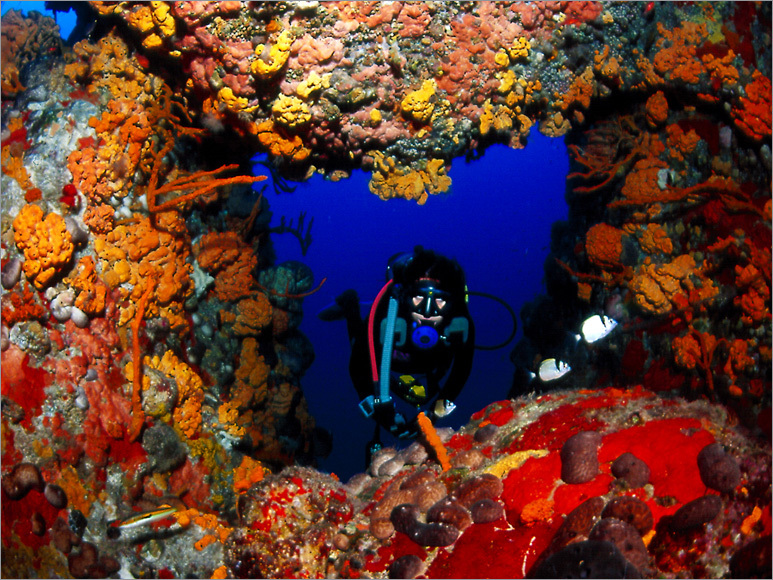 From Aegean and the Mediterranean, almost all the world’s seas and coasts can be reached. The Black Sea coast of Turkey is a well-protected, magnificent and green environment and a secluded coastal line. Numerous bays and ports of refuge are located in this coastal line. This region has a warm climate throughout the year. Marmara and Aegean coasts, with their numerous bays, islands, ports, historical and cultural richnesses and natural beauties, deserve to be counted among the important yachting regions. Istanbul, as a city of seven hills, where the sea and the land is in one, own the most beautiful silhouette, the most impressive natural beauties of the world. In Istanbul, watching the fantastic sunset, the magnificent castles, palaces, mosques, minarets, cupolas, and the unique historical monuments, distilled throughout the centuries from the Byzantine to the Ottomans from the sea is an amazing experience for the yachtsmen. 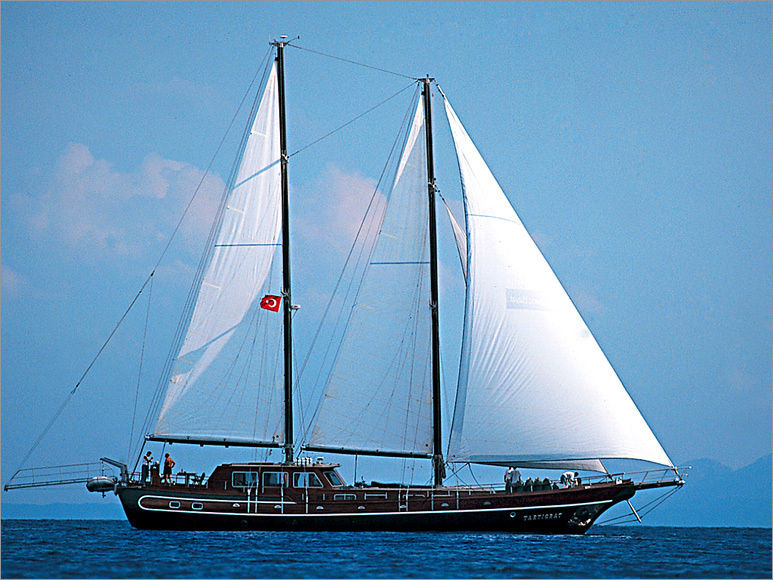 After sailing through the breath-taking Bosphorus, going under the magnificent bridges that join Europe to Asia, passing through Halic (the Golden Horn) lined up with mosques, and sailing in the secluded bays of the Prince’s Islands, all types of needs can be satisfied in the two marinas in the region. On the European side, Atakoy Marina and on the Asia side, Setur Kalamis-Fenerbahce (Amiral Fahri Koruturk) Marinas, serve their customers around the clock.